place each chicken breast between sheets of plastic wrap and pound with a meat mallet to about 1/8″ thickness. top with a slice of ham and add about 2 tbsp cheese on top. sprinkle with thyme, salt and pepper to taste. roll up chicken breast jelly roll style, tucking in sides and rolling up. you may want to secure the rolls with a toothpick, i didn’t find it to be necessary. place rolls in a lightly greased 9×13 baking dish. brush the top of the roll with melted butter and rub crumbs on top of chicken rolls. bake at 375° for about 30 minutes, or until chicken is golden brown and juices run clear. 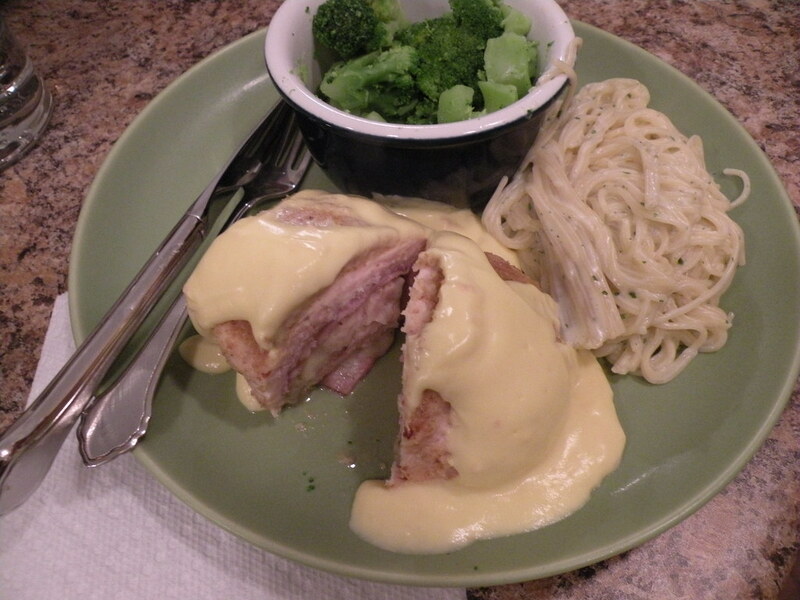 serve with chicken cordon bleu sauce. to make the chicken cordon blue sauce: in a small saucepan, mix together the soup, sour cream and lemon juice. heat over low heat, stirring occasionally, and serve hot over chicken rolls.